You are looking for a place to relax and rest. You are looking for somewhere that is close to the sites of north-west France without being in the congested tourist areas. You want to get to the real France where life is slower, gourmands are satisfied and where memorable holidays are made. Le Haut Malaisé is for you. 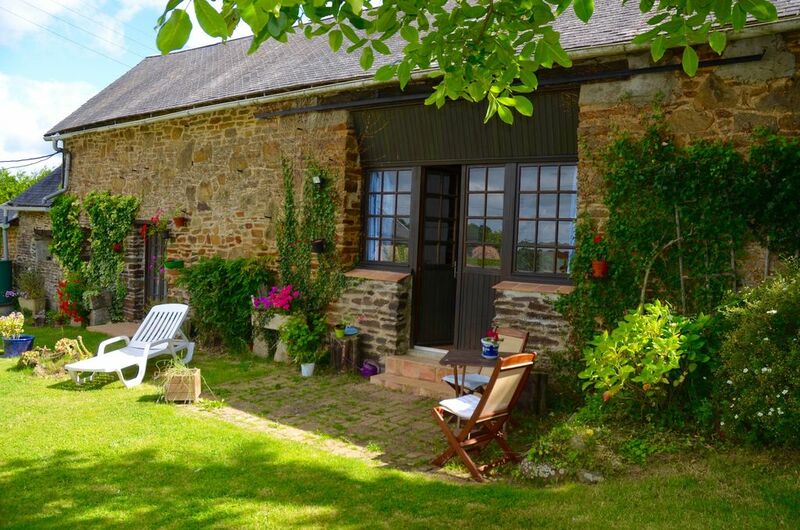 A fully self-contained gîte, this converted barn has two bedrooms sleeping four, full kitchen, bathroom with shower and a large sitting area with a log burning fire. It is located on the borders of Brittany, Normandy and the Loire Valley and is easily reached from the cross-channel ferry ports at Caen, St. Malo and Cherbourg, the airports at Rennes (RNS), Nantes (NTE) and Dinard (DNR) and is less than 4hrs driving from Paris. It is ideally located for the tourist attractions of north-west France with the world famous Le Mont Saint-Michel only an hour away. The D-Day landing beaches are close by and Le Haut Malaisé was used by Allied forces during the liberation of France. The beautiful Loire Valley views and wines are easily accessible. The surrounding area is known for the quality and variety of its food which is easily obtained in the weekly markets. There are many beaches in Normandy and Brittany and the local rural countryside is excellent for walking, running and cycling. Motorsport fans are two hours from the Mulsanne straight for the 24 Heures du Mans and the Tour de France often passes through the area. A quintessentially French building, Le Haut Malaisé is furnished with French furniture enhanced with pieces from our travels around the globe. We have lived for many years in Asia and our adventures as international travellers have influenced how we set up and run the gîte. We know what relaxing holidays are like and we want our guests to have that same experience. It's all about bringing you tranquility. The comfortable master bedroom double bed with the finest quality linens will bring sweet dreams as you reflect on great days. The full sized bunk beds in the second bedroom are suitable for children or adults and mean that a group of four can comfortably stay. A travel cot is available for toddlers on request and comes with organic hand sewn bedding. The expansive sitting area is centred around the log burning fireplace. Bright and airy because of the double-height ceiling, it is a great place to sit back and relax. Fitted with a TV and DVD player and with free wi-fi connection. A fully equipped kitchen with a dining table for four. Coffee maker + grinder, NutriBullet blender, electric oven with gas + electric hob, quality table linens and glassware including wine decanter. Everything that you need to make the most of the local produce. Bathroom and shower with separate toilet. With grinder to grind your beans! Nina and her family are so welcoming and where there to meet us when we arrived. They supplied us with a lovely welcome baskets of local bread, cheeses and wine. Nina was also very happy to share her local knowledge and provided plenty on info sheets to help plan your time. It is so peaceful and relaxing it was hard to get motivated most days. Would definitely recommend to others. Bonjour Alex & Colin and Family It was our Pleasure to host you all and so wonderful that you enjoyed your stay with us. The gite is beautiful, equipped with everything required for your stay. We arrifedbto a very thoughtful welcome pack which included lots of local produce. There was an information pack high lighting local areas of interest. The family were very warm and welcoming without being intrusive. Michelle & Nick & Nathan it was our pleasure to host you all. Super lovely & Fun family. We loved that you had some great trips to local places of interest Mont St. Michel, St. Malo and many other places, and you tried so many delicious French delights :) Stinky cheeses galore & Fab French Loire Valley Wines. à bientôt et Merci Vous. Heerlijke weken gehad hier, super gastvrij ontvangen, alles aanwezig in het huisje. Genoeg speelgoed voor de kinderen. Op de wat koudere avonden heerlijk de open haard aan. Wie authentieke Franse stijl zoekt zit hier goed. Check the website for more information and links to local attractions. Google for the house name "Le Haut Malaise"